Nowadays, with the ever-changing online landscape, the channels you choose to reach your potential customers are more important than ever. You need to deliver timely content to engage user interests with your brand even when your customers are not on your site. Automated push notification is an optimal channel in the post-GDPR era, allowing growing e-commerce brands to "push" communications to target users. What are Web push notifications? Simply put, they are messages that are pushed to the recipients' device via Web browser. The main difference between push notifications and other messaging channels is that push doesn't require the end recipients to be active within the specific medium: As long as the person is online with their devices, the message will appear at the specified time. Therefore, it is the perfect channel for your e-commerce shop to communicate with visitors about after they have left your site. How effective are e-commerce push notifications? 1. How Effective Are Push Notifications? Let's look at the myth that everyone opts out of Web push notifications. Automated push notifications have an opt-in rate of around 5-15% compared with 2% for email newsletters! A crucial part of your e-commerce push notification marketing strategy is to optimize, optimize, optimize! Push notifications are only as effective as you make them. 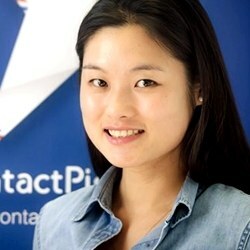 Joyce Qian is director of marketing and growth at ContactPigeon, an e-commerce-focused marketing automation solution used by L'Oreal, The Body Shop, Hertz, and hundreds of online businesses.